I had some dreams about him, but I couldn't ever remember them that well - and if he was starring them, he was always not within reach. But last night my dream was extraordinary vividly! I dreamt that, in fact, I was him. I was the (Heath Ledger's) Joker. And it felt pretty real, which made it even better. Everyone wants to have lucid dreams, but I am glad when I do not have them. In my dreams I hate it to know when I'm dreaming. It takes all the excitement about it away. ... Anyways, even without dreaming lucidly I could easily control my actions. The first setting was a big city at night. It could have been Gotham City, but I'm not sure. I didn't meet Batman, so probably not. And I remember that I was in the second setting in daytime, a big white, castle-like mansion, chased by some people. But I felt no remorse or guilt at all, like the Joker would. Actually, I killed some girls in another setting as well - I jumped and cut in one second all their throats with my knife. Did you ever experience a dream like that? If you did, how did you find it? If not, tell us your other dreams! I had a dream about the Joker, and it was actually quite odd. It was really real, but there was little detail to it. 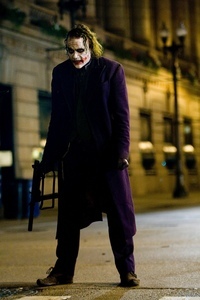 It was the Heath Ledger version of the Joker, and him and Batman were fighting and I was witnessing it. We were in a dark alley. Then out of nowhere, the Joker grabbed me and threw me into his car, and sped off. Then dream twisted into some crazy car chase where Batman was trying to kill us, other than trying to save me. It was a fun dream, though. :D I'll probably remember that one forever. This dream sounds great and exciting! Interesting dream. I've had these on and off dreams since I was little about the Joker. From the cartoon versions to the ones portrayed in films. The latest dream I had was about him kidnapping me in the middle of the night to be told by Scarecrow ,after completing a DNA test, that The Joker was my biological father. That's when I woke up. When I went back to sleep, I guess it was set a few month or year later from the previous dream. He was telling me about my mom Harley Quinn and how he killed her. We were just sitting at a table in some kitchen. Turned out his scars were fake when he peeled them off..................and then the dream ended. Weirdly, the setting was a Tarantino film of my imagination, which at the same time happened to be "real" (in my dream). I, as the Joker, had been captured and thrown into a prison of which Tarantino was the boss. Obviously, I wanted to get out, so I walked around in the areas I was free to go, in order to find something for my escape. I happened to come across a few guys, of which one was an actor I knew from another (not in our reality existing) Tarantino film. His buddy had a clasp knife in his hands and was so proud of it, because no prisoner was allowed to have weapons. I saw my chance; not because I wanted the knife, but because one might be freed if they told the boss that someone had a weapon, and if they gave him additionally 3 Euros, which were in the prison very hard to find. But luckily I found them, and so I went to see Tarantino in order to tell him of the guy with the clasp-knife. I was led into a room, which looked similar to the one in the Interrogation Scene of The Dark Knight. There Tarantino sat, and he asked whether I was still crazy. I said: "Well, I will always be crazy somehow, you know-? ", at which point Tarantino hold a gun at my viewpoint, and I went "Nonono! Ok ok ok, I am not crazy, of course I am not anymore!" Then I told him about this guy, he only nodded absently. Meanwhile, a weird Medusa- and insect-like creature of a woman, underneath the ground, whispered up to us through a strange window. She was pretty nasty looking, but Tarantino could not stop saying how beautiful he found her - he was hypnotized by her powers. I did not notice them really. Anyways, Tarantino opened this window/door whatever, this creature escaped and suddenly the alarms of the prison went wild. All the doors of the cells and the entrance door opened in unison, the prisoners screamed in ecstasy. I hastily glided out with a pile of dollars underneath my shoes, worrying the prisoners might stamp me to the ground if I would not escape first. This is when my dream ended. My little sister actually had a dream where she worked under Harley and the Joker; I don't know the details because it scared the hell out of her. She said that she worked under them, but wasn't a 'goon'-they called her "Ace", as a matter of fact. Apparently there was a heist gone wrong and she got shot in the leg; it was so real that my mom shook her awake and had to convince her that no, she wasn't shot, and no, the Joker and Harley Quinn weren't in the room with her. She woke up a bit more and started crying at that point. It was...odd. She still won't talk about it, and I know she remembers because she won't watch the Dark Knight anymore, and she can't look at my poster of him without shuddering. Okay so in the dream, my family had already gone to bed and I was in the bathroom getting ready for bed. My phone pinged and a whole bunch of messages came through from a number I didn't know. Confused, I looked at the texts to see they said 'I'm outside' and 'Let's play a game' and also 'I'll be waiting' There were other messages too but I can't remember all of them, only those main three and there were random emoji's in the texts too. I felt a bit creeped out but ignored them and went to sleep in the double bed next to my sister (which is weird because in real life I have my own room and this double bed was my parents' bed). Anyway, I fell asleep and shortly after I woke up and in the pitch dark, I saw a figure coming into the room and walking at my side of the bed. I was terrified and the figure was revealed to be Jared Leto's Joker (which I'm kinda obsessed over but in the dream I was petrified). He hauled me out of the bed and forced me to go outside with him (there's a park opposite my house). He forced me to do some sort of trials to test whether I could be his partner in crime, and if I failed then he would kill me. I passed and we went back inside and he passed me a gun and said "You have one more test, you have to kill your sister." I refused and he got really mad and basically forced my sister to stand in front of me (she awoke to Joker yelling me and I think slapping me in the process to obey him). But it was weird - it was my sister but it didn't look like my sister at all. I just stood there aiming the gun at her and Joker scared me by shaking my shoulders to tell me to shoot her, when my finger accidentally pulled the trigger and she died, and fell backwards into the bathtub. My hand shook uncontrollably as Joker came to stand next to me to congratulate me. I turned the gun on him next, scared out of my mind of him as well as of what I had done. Then he did that thing (in the cut scene of Harley chasing after Joker on the bike) and he said "Do it, do it do it." and he then took the gun from me and held it to his head for a laugh. Then I remember my dad yelling at Joker and at me over what we had done, and I allowed myself to follow Joker out the house because I couldn't bear to be with my family anymore for what I had done. Then Joker and I basically walked in the middle of the night throughout the streets of my neighbourhood. And it was strange because as we walked, I kinda felt myself go insane the more I was around him, and my appearance kinda transformed (I was wearing these badass heeled boots and I think my hair was in pigtails like Harley's except more curly). And my fear of him was replaced by love for him and I was REALLY attracted to him. And the end of the dream we were at some market with blue tiled floors and I think someone else was walking with Mr. J and I. I was giggling like Harley but Joker got angry at me and hit me because I was irritating him or something. (Also Aang from Avatar the Last Airbender was there and he was a baby in a basket and I have NO IDEA why he was there hahaha xD anyway not so important lol) The last thing I remember was lovingly stroking Joker's handsome face and he placed his hands over mine. Instead of looking at me lovingly though, his eyes darted to me and then to the side and back and forth. He also let a devious and evil looking grin when he glanced at me. He was so HAWT and DAMN!!! But guys does anyone know what this dream means? And this dream was very long and awesome :3 and it was so realistic!